I've been doing a lot of thinking and re-arranging of my schedules lately - mostly because my time-management was going haywire! I have some very dear and close friends who make me accountable for this, and I know their hearts are to make sure thatI don't overload myself. It struck me earlier today that this will be the 30th Christmas that John, my incredible hubby, and I have been together. In some ways, it would have been interesting to know then what the future would hold for us, but the journey would not have been half as interesting! Of one thing I am completely sure, though – he is my Soulmate, my rock, and my very best friend, and life with him, and the boys, has enriched me in ways beyond measure. Our youngest son, Andy, turned 21 twelve days ago, and therefore in my dearly-loved, and much-missed mother-in-law’s eyes, would now both be officially classed as adults. The journey of parenthood is never easy, and each child comes into the world with its own set of unique skills, abilities and challenges. 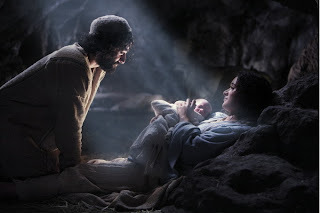 At this Season, I often wonder how Mary thought of her future that very first Christmas – the birth of her firstborn Son could hardly have been less auspicious. But we often focus on Mary, and give little thought to what kind of a Soulmate Joseph had to be, to bring up this child of hers, but not his, in the face of open condemnation and hostility. So here’s a toast to the unsung heroes - to all the Dads out there who hold their families together, who guide, protect and provide, often wondering if they’re doing it right, but not wishing to admit it out loud. To my own Dad, whose legacy lives on, and who pointed me to the Greatest Father of All. This is the word I shared last weekend at our local Church. I pray it blesses you. In New Testament times, many people travelled by ship. When a large ship wished to come into harbour during a low tide, it was often unable to do so, because of precarious sandbars in the way. Nowadays we can dredge harbours, but it was not often possible then. Jesus, our forerunner, has made it possible for you to have total faith and hope that He will bring you safely through this. Heb 4; 4 encourages us to “Hold on tight to the hope you profess”. 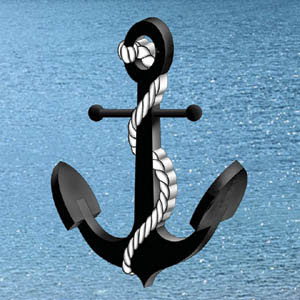 The anchor is in place – just keep on holding on"
Just thought you'd like a few pics of my leaving "Do" from my Counselling Agency. 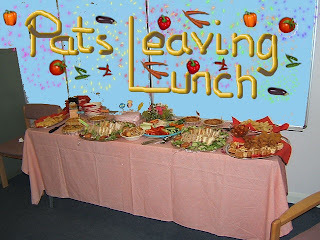 I was amazed at the number of people who came - some people will do anything for free food!!! - but I was genuinely touched by the numbers of those who turned up. Many of these social events prove to be rare occasions of frivolity in an otherwise fairly stressful working environment. When we do get together, we usually all contribute to the food, and over the years, John's Coronation Chicken has become a firm favourite . Nobody bothers to ask me what I'm bringing anymore - just as long as I come with a trayload of his chicken! I do give him the credit every time, but somehow this event became a lot to do with chicken in various forms! 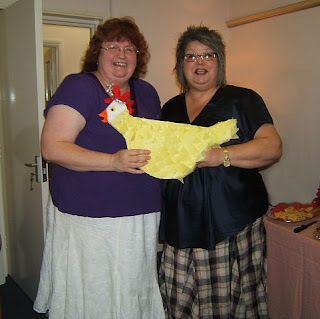 My mate Sally even made me a tissue paper chicken as a memento! Sally is also a brilliant poetess, and wrote "An Ode to Pat", which she read out, and then presented me with a framed copy of the poem. 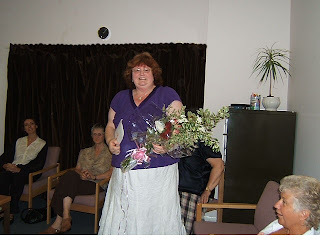 I was also given a beautiful bouquet, and a very nice cheque, which I am spending on cardmaking equipment - something for me to do in all this free time I'll have, you understand! For those who could not be there, today was Meg’s funeral. 273 people came to express their deep respect for a lady who was, quite simply, unique. I don’t think I’ve ever experienced a funeral quite like this one – and I’ve been to a few – where the sense of the person who has gone has somehow felt so present. It was not in a scary or eerie way – there were just things that were done in the preparation for the day, as well as during and after the service, that had many of us quietly smiling, “Meg would have liked that”. 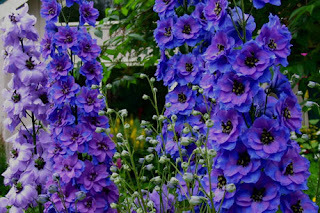 The flowers were beautiful – lots of soft blues, creams and deep pinks; roses, freesias and delphiniums dominated the colours and scents of the day. But above it all was this huge sense of just how much one life, sold out for God, in an incredible gentle way, can, and has, affected hundreds. This is no exaggeration, for the ripples of Meg’s life and legacy will continue in the lives of many. It was a day that we had hoped would never come – at least, not for us. Not for Meg, though - she’s having a ball. However, I believe her son Neil, in an amazing tribute, summed it up so wonderfully. He said that there are some people in life who have completed all that God asked them to do, and so He calls them home. What a memorial – someone who did EVERTHING God asked them to do. Wife of One, mum of two, counsellor to....lots!